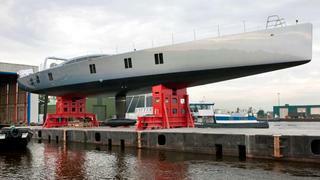 The Dutch yard Vitters Shipyard has launched the 42.6m sailing yacht Sarissa. She is the largest carbon sloop ever built in the Netherlands, and one of the largest worldwide. Her lightweight construction and rigging with her state of the art systems and lifting keel are only a few characteristics of this performance focused design by naval architect Bill Tripp. The distinctive interior design by Rhoades Young, which combines various finishes like carbon, glass, stainless steel, leather and several types of wood, ensure a stylish and comfortable stay on board. The layout and deck plan show a strong emphasis on a clean and modern look on deck and family friendly layout below deck. This yacht is designed for adventure and pleasure. To this end, the aft cockpit can be transformed into a swimming pool for the children. The main sheet has been placed on an arch spanning the cockpit to keep the deck clear. The coamings sweep gracefully around the superstructure giving a strong visual accent as well as good protection from the elements. On the technical side, Sarissa is fitted with a 490hp Caterpillar C12 DI-TA engine.